This film will either drive you up the wall or make you laugh your gut to bursting. It took me a while to get it after being recommended it by a friend, but on the second viewing I could not stop laughing! Zoolander follows the life of Derek Zoolander (Stiller), a three-time male model of the year whose life comes crashing down when he loses his award to young upstart Hansel (Wilson). He doubts himself, and after being shamed in an article by journalist Matilda Jeffries (Taylor) turns his back on the industry altogether. That is until acclaimed fashion designer Mugatu (Ferrell) decides to hire him for his latest range. Meanwhile, investigatory journalist Matilda discovers that not all is as it seems with Mugatu, as he brainwashes Zoolander to attempt to murder the Malaysian Prime Minister. To say this film is stupid is an understatement. Everything about it is moronic, except the journalist Matilda, but that is it’s success (or failure, depending on how you see it). If you watch it intently then it’s not as good, but if you watch it with friends, just chilling out and laughing while it plays in the background then it is a rip-roaring success! Think Family Guy without the normality, and you’re on the right lines. It is not trying to put funny people into funny situations, it’s putting utterly ridiculous people in fictitious worlds. This film is also insanely quotable with the stupidity uttered, mainly by Derek Zoolander. I can understand why this would also drive people insane. For one, Ben Stiller and Owen Wilson both divide opinion, and the fact that there is almost nothing sane about Zoolander. This is one of those films that if you’re not laughing within the first 15 minutes then you probably won’t enjoy it. 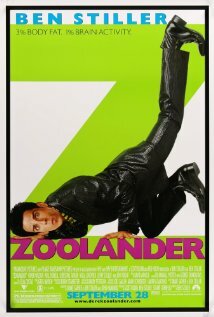 It is worth noting that Ben Stiller does an amazing job as Derek Zoolander. He never lets the character slip, constantly keeping the dopey look on his face and the almost-slurred tone in his voice. Most of his good work was done making the scripts with Drake Sather, but it still needs to be portrayed correctly – and who better to do it than the guy who wrote him! Owen Wilson also does a good job as his rival Hansel, mainly because part of me thinks Wilson is a little bit like Hansel in real life! Its okay performances across the rest of the board in Zoolander. The directing in this film by Stiller is actually to a good standard. The shots are on point and give the film its action edge that would have been missing in the dialogue. The fact this review is so small shows the simplicity of the film. Maybe not one for the film critic, but definitely an easy laugh for the easily pleased – like me!